Not to be confused with Polo neck. All three terms may be used interchangeably. Polo shirts are usually made of knitted cloth (rather than woven cloth), usually piqué cotton or, less commonly, interlock cotton, silk, merino wool, or synthetic fibers. A dress-length version of the shirt is called a polo dress. René Lacoste, the French seven-time Grand Slam tennis champion, felt that the stiff tennis attire was too cumbersome and uncomfortable. He designed a white, short-sleeved, loosely-knit piqué cotton (he called the cotton weave jersey petit piqué) shirt with an unstarched, flat, protruding collar, a buttoned placket, and a shirt-tail longer in back than in front (known today as a "tennis tail"; see below), which he first wore at the 1926 U.S. Open championship. Beginning in 1927, Lacoste placed a crocodile emblem on the left breast of his shirts, as the American press had begun to refer to him as "The Crocodile", a nickname which he embraced. the jersey knit piqué cotton breathed and was more durable. In 1933, after retiring from professional tennis, Lacoste teamed up with André Gillier, a friend who was a clothing merchandiser, to market that shirt in Europe and North America. Together, they formed the company Chemise Lacoste, and began selling their shirts, which included the small embroidered crocodile logo on the left breast. Polo players Paul Barry, Vichai Srivaddhanaprabha, Adolfo Cambiaso, Martin Valent with fellow player Prince William (center), wearing polo shirts as part of their uniform. Before Lacoste’s 1933 mass-marketing of his tennis shirt, polo players wore thick long-sleeve shirts made of Oxford-cloth cotton. This shirt was the first to have a buttoned-down collar, which polo players invented in the late 19th century to keep their collars from flapping in the wind (Brooks Brothers's early president, John Brooks, noticed this while at a polo match in England and began producing such a shirt in 1896). Brooks Brothers still produces this style of button-down "polo shirt". Still, like early tennis clothing, those clothes presented a discomfort on the field, and when polo players became aware of Lacoste’s invention in the 1930s they readily adopted it for use in polo. In 1920, Lewis Lacey, a Canadian born of English parents in Montreal, Quebec in 1887, haberdasher and polo player, began producing a shirt that was embroidered with the logo of a polo player, a design originated at the Hurlingham Polo Club near Buenos Aires. The term polo shirt, which previously had referred only to the long-sleeved buttoned-down shirts traditionally used in polo, soon became a universal moniker for the tennis shirt; no later than the 1950s, it was in common usage in the U.S. to describe the shirt most commonly thought of as part of formal tennis attire. Indeed, tennis players often would refer to their shirt as a "polo shirt," notwithstanding the fact that their sport had used it before polo did. In 1972, Ralph Lauren included his "polo shirt" as a prominent part of his original line called Polo, thereby helping furthering its already widespread popularity. While not specifically geared for use by polo players, Lauren’s shirt imitated what by that time had become the normal attire for polo players. As he desired to exude a certain "WASPishness" in his clothes, initially adopting the style of clothiers like Brooks Brothers, J. Press, and "Savile Row"–style English clothing, he prominently included this attire from the "sport of kings" in his line, replete with a logo reminiscent of Lacoste’s crocodile emblem, depicting a polo player and pony. This worked well as a marketing tool, for subsequently, due to the immense popularity of Lauren’s clothing, a majority of English-speaking westerners began to refer to Lacoste’s tennis shirt as a "polo shirt". Still, "tennis shirt" remains a viable term for all uses of Lacoste’s basic design. 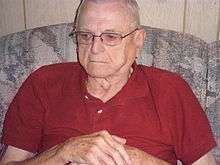 An elderly golfer wearing a red polo shirt. Over the latter half of the 20th century, as standard clothing in golf became more casual, the tennis shirt was adopted nearly universally as standard golf attire. Many golf courses and country clubs require players to wear golf shirts as a part of their dress code. 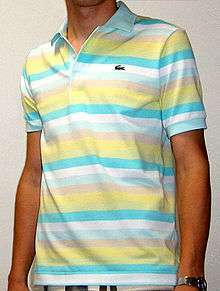 Moreover, producing Lacoste’s "tennis shirt" in various golf cuts has resulted in specific designs of the tennis shirt for golf, resulting in the moniker "golf shirt". Golf shirts are commonly made out of polyester, cotton and polyester blends, or mercerized cotton. The placket typically holds three or four buttons, and consequently extends lower than the typical polo neckline. The collar is typically fabricated using a stitched double-layer of the same fabric used to make the shirt, in contrast to a polo shirt collar, which is usually one-ply ribbed knit cotton. Golf shirts often have a pocket on the left side, to hold a scorepad and pencil, and may not bear a logo there. 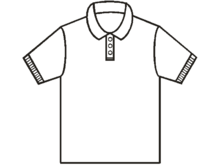 Wikimedia Commons has media related to Polo shirts. 1 2 3 4 5 6 7 "Lacoste Sportswear – Fashion Designer Encyclopedia". 1 2 3 4 5 6 7 The Story of Lacoste. Retrieved from http://www.lacoste.com/library/pdf/LACOSTE_history_histoire.pdf. 1 2 3 4 Style & Design: Lacoste. Time Magazine, Winter 2004. Retrieved from http://www.time.com/time/2004/style/111504/article/lacoste_on_a_lark_and_a08a.html. 1 2 3 The Brand Channel, Lacoste profile. ↑ Butterworth, Helen. "The History of the Polo Shirt". Retrieved 22 November 2012. 1 2 3 "Brooks Brothers – About Us". ↑ Official Ralph Lauren history website: "1972". ↑ Official Ralph Lauren history website: "1967".